Please note we are not recruiters, we do not charge anyone, vacancies on our site are totally free, there is no sign in, sign up or registration required, find the contact number or email address from below Description and contact company direct through Email Address or through Phone Number. 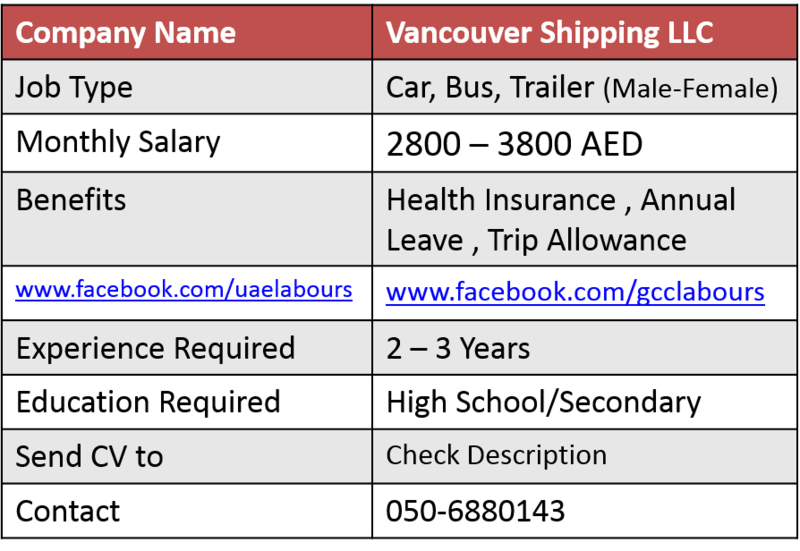 Dubai Based Vancouver Shipping & Customs Clearing LLC Looking for Young Energetic Heavy Trailer Driver. 1: Minimum 2 years’ experience and knowledge about UAE Ports and Roads. 2: Valid UAE Heavy Driving License. 4: Must Have Good Knowledge of Dubai and Sharjah Port Procedure , Like Off Loading and getting MT Containers. 6: Speak English , Hindi, Punjabi , Arabic Speaking Preferred. Salary: 2800 – 3800 AED but not fixed. Benefits: Health Insurance , Annual Leave , Trip Allowance. Interview Date: Call above number for date. Interview Timing: Call above number for timing. Interview Location: Al Kabyal Centre Near cars Taxi Corporation , Street # 9 , Vancouver Shipping and Customs Clearing LLC , DUBAI. We are looking for a responsible, experienced, loyal and trustworthy driver in Dubai. You should have at least 5 years experience in the UAE, know the roads in Dubai very well. Good character, punctuality and professionalism are very important for us. Salary: 2000 AED + 500 Housing Allowances. Benefits: Health Insurance, Return Ticket. Interview Date: 4th January 2017. Interview Location: Shop 21 Al Khaleej Centre, Bur Dubai. A leading General contracting company in Dubai urgently looking for an experienced heavy vehicle bus driver. Should also have a light vehicle driving license. Should be aware of the locations in the UAE and should preferably speak basic English. We want someone to join us immediately. Prefer candidates on Visit Visa. Company Name: Palace Group LLC. As a Valet Parking Attendant, the employee is required to perform the following duties and undertake the following responsibilities in a professional manner. 1: Actively greeting the arriving vehicles. 2: Make sure to always open the vehicle’s doors and hand over the claim ticket to the patron. 3: Carefully and responsibly collect the charges associated with the valet parking. 4: Park and retrieve patrons’ vehicles with maximum care and awareness. 5: Show exceptional behavior and customer service while dealing with clients and solving complaints. 6: English Language is Must. Benefits: Medical Insurance, Transportation, Food, Uniform And Laundry, Paid Annual Leave And Other Benefits. 1: Strictly Filipino Female only (Married or single). 3: Must have a valid UAE driver’s license. 5: Salary: starting AED3000+ weekly off and salary may increase depending with the work performance. 6: Stay in with separate room, free food and personal things. Benefits: To Be Discuss Later. Note: Please do not pay Anyone for above Jobs, if any of above vacancy seems scams or fake, please comment below or on our Facebook page for awareness.